I've had my eye on this book for a while so when I found out I could borrow it from my local library, I put it on hold. Moll is an adventurous young girl who lives in a clearing in the forest. She also happens to be a gypsy, and even has a cool wagon. Oh, and she's got a wildcat called Gryff. The night her nightmares take her over the river's boundary she's determined to get her stolen cob back. 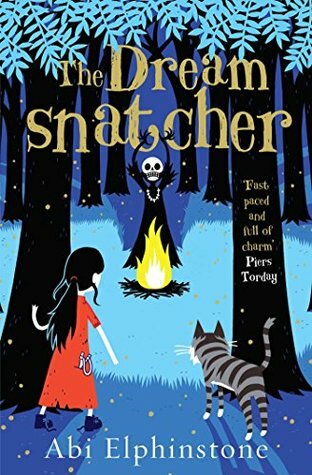 But the horrible Skull has taken Jinx and he's a witch doctor who has some very evil plans for Moll. Now that he knows who she really is, he's determined to get her full name so he can complete a dark magical ritual. Moll doesn't know, but she's a lot more special than she ever imagined. She also has a cool destiny to fulfill. Wow. This was such a wonderful book. I loved Moll's strength, and determination. She's stubborn but kindhearted. Also, Siddy and Alfie were cool. As well as all the other, many cool characters. The gypsy customs--including their belief in nature and magic--were so interesting! I enjoyed this book so much. There were certain times when the story felt like a waking nightmare. Seriously. The imagery was amazing! I love fast-paced adventure stories with a twist of magic.